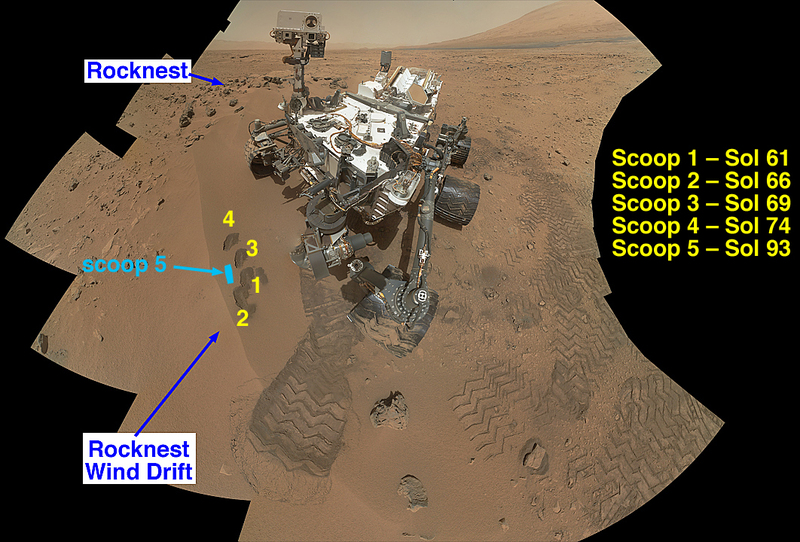 The “scoop” locations for soil analyzed by Curiosity (Credits: NASA/JPL/Caltech/MSSS). Ever since a fateful interview on November 20 with the enthusiastic principal investigator for Curiosity, John Grotzinger, the world has gone Mars-mad. Everyone who’s ever looked up at the stars has been itching to know what could be the “one for the history books,” Grotzinger described and jumping to the conclusion that it must be signs of life. Meanwhile, every public relations staff member at NASA has been pulling their hair out trying to tamp down the expectations in a vain attempt to prevent the universal disappointed that inevitably followed: on December 3, Curiosity scientists revealed the “historic” data. And it sounded like a lot of scientific gobbledygook. Now, there is no question that detection of life on Mars would be historic, but Curiosity isn’t precisely looking for life and is still pretty far from the most likely location of prehistoric bacterial remnants. Beyond those pesky details, many people seem to have lost sight of the more fundamental truth: Martian life is not the only discovery of worth waiting to be found on the Red Planet. The entire Curiosity mission is pretty historic when it comes down to it: it is enabling us to investigate the Martian surface and subsurface in ways we never have before. And for those scientists interested in scientific gobbledygook, today’s data release was pretty heady stuff. Deuterium/Hydrogen ratios of Martian soil were measured for the first time ever (Credits: NASA/JPL/Caltech/GSFC). 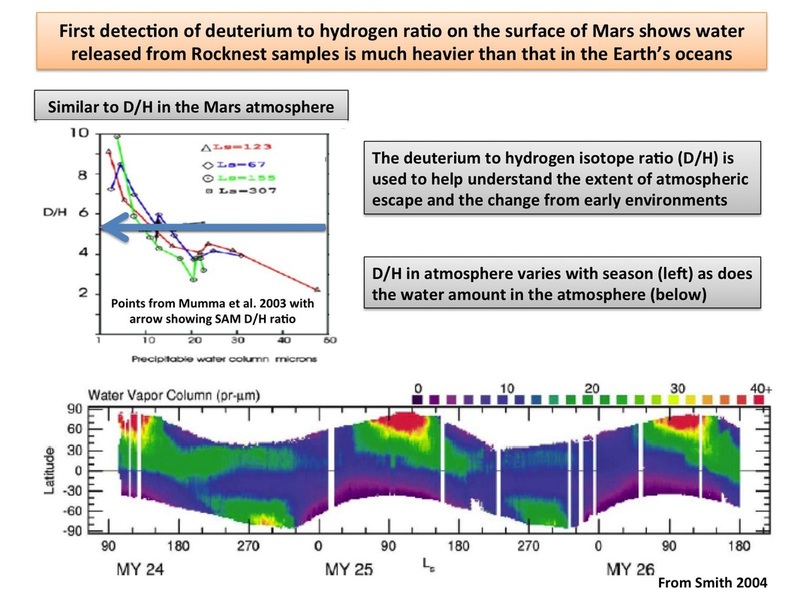 For the first time, we have Deuterium/Hydrogen ratios measured from the surface of Mars rather than approximated from orbit. D/H gives an indication of how much hydrogen – and water – may once have existed on a planet. It is a key datapoint to be considered in constructing a viable theory of planetary evolution and one that helps us understand how Earth came to be as we know it today. 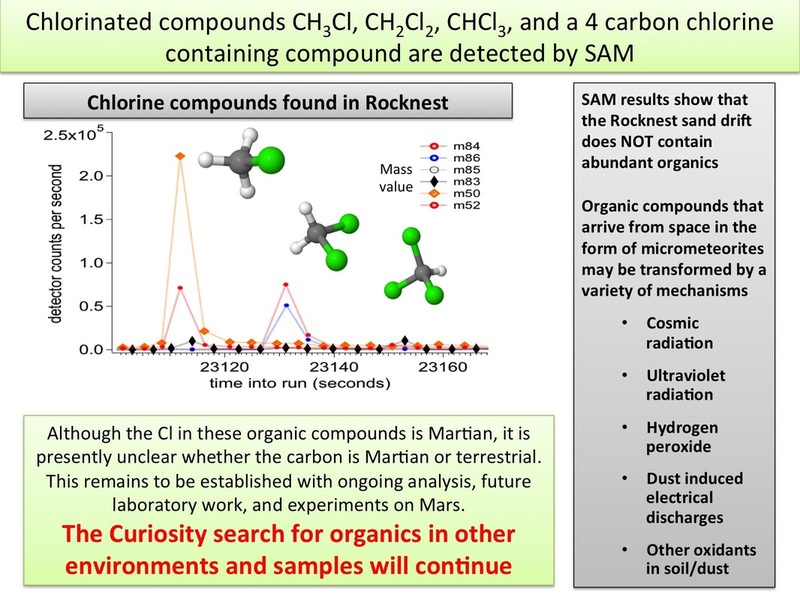 Curiosity’s SAM instrument suite – Sample Analysis at Mars – also turned up some organic compounds, a term that NASA seems to be avoiding or explaining ad nauseum in its press releases, trying to keep those ubiquitous members of the public from running amok claiming there are pesticide-free vegetables growing on Mars. Chlorinated organics found by Curiosity in Martian soil are just the beginning in a long process of discovering exactly what the rover has found on its new home (Credits: NASA/JPL/Caltech/GSFC). All my life I’ve wanted to know if there is or was life on Mars. We’ve sent quite a few landers – at least 6 that I remember- and despite the high cost of this mission and the sophisticated analytical laboratory and the tremendous publicity the landing of this golfcart sized rover engendered, we seem to be no closer to this simple question then we were back in 1977. It’s pretty pathetic really. The limits of robotic exploration of this world keep being shown again and again. Think of it: this mission costs billions and the Curiosity rover is the size of a golfcart. Yet it creeps at yards per day (partly because they are scared it might tip over and I guess if that happens its all she wrote) can’t dig through more than an inch of soil, and can’t directly search for life or even past life. The radiation research is valuable only if we actually put a space colony or base there, as is the weather data. If anyone does put boots on Mars, it’s most likely to be Space X as NASA (admittedly mostly to factors beyond its control) can’t stick to any long term plan, esp. if that plan involves astronauts. The landing was very interesting and impressive, but once again , something I could care less about if we have no plans to put that knowledge in the service of human explorers or colonists. I’m not interested in finding out “more about the history of Earth” by going to Mars, esp. as the agency in question is falling behind in its Earth science satellite programs. If we send probes to Mars, it should be for better reasons. Those reasons would include the existential question of is or was there life on Mars and the more utilitarian reason of trying to colonize Mars. What I specifically mean is any probe we send should get results pertaining to one or both of those goals. Here I am HOPING that after 30 years we can finally settle the question of whether there are organics on Mars -something a human could probably have done in under a day! In short, I’m not impressed by the hype. Show me some useful results. No one would be more happy than I if Curiosity happened to trundle over a small fossilised Prokaryote colony proving once and for all that life did exist on Mars, albeit 3.8 billion years ago. The truth is it’s difficult to find these types of fossils on Earth never mind Mars. Curiosity was sent to the red planet to determine if water ever existed there. The large rover has discovered evidence that yes it did, and in large shallow salty oceans (which may have been suitable for microbial life to boot)! OK, excitement level building! But hang on… it’s not just water that life needs. what about the atmosphere on Mars at that time? What about other geological processes…where they ALL working towards supporting life as they were on prehistoric Earth? As impatient as I am I realise that all these questions need to be resolved to enable scientists to build up a full picture of the early Marsian environment, and to answer the fundamental question why did Mars follow a different evolutionary path than that of the Earth and did this deviation cause life to fail on the red planet. Curiosity and the fleet of landers & orbiters are slowly uncovering the answers to these questions which are giving us a complete comprehensive picture of the evolution of Mars. Research is always at a slower rate than I would like! Remember the days when you had to peel potatoes and fry them? I now find myself tapping my foot impatiently waiting for my 2 minute Quick-Chips to come out the micro-wave.